Adaptil Spray is a specially formulated product with appeasing hormone for relieving stress in dogs. Application of this spray in challenging situations like travel, separation, vet visits, fireworks, and thunderstorm calms the pet down immediately. The product has a tranquilizing effect on the mind and induces a sense of safety in dogs which helps him stay comfortable for long. 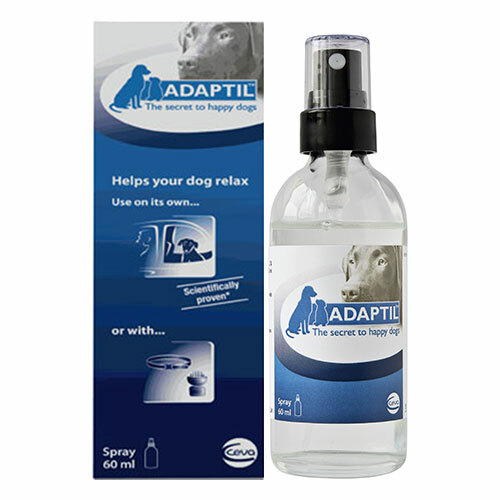 Adaptil Spray contains a synthetic dog pheromone which produces a happy effect on dogs. This synthetic pheromone imitates the natural pheromone and relaxes the flexed brain muscles in dogs. This gives a sense of safety and reassurance to puppies in stressful environment. Spray the solution 8-10 times in the environment 15 minutes before the expected effects. You can directly spray it on beddings, crates, kennel, car, etc. The product should last until 4-5 hours. However, this time frame may vary for each animal. Re-spray the solution if you notice reduction in the effect. Do not spray the solution directly on animals or near an animal’s face. Keep the product away from sources of ignition. Do not spray on the pet directly.